The Blues setup in an unchanged 4-2-3-1 from Old Trafford with Fellaini, Osman and Pienaar providing close and often narrow support to Jelavic with the width coming from Distin and Hibbert in the fullback slots. Fulham brought in former Grasshopper Kerim Frei to play left wing with Dempsey moving inside from the left to play a central role behind Pogrebnyak in a 4-4-1-1. The below heatmap shows the average position of the player’s and their font depicts the amount of touches of the ball. The Blues were a lot sharper than Fulham in the opening period of the game both on and off the ball. Passing wise we completed 559 short passes compared to our average per game this season of 345. We had the majority share of the ball (52%) and in doing so registered a 90% pass completion which is up 13% on our average of 77%. We were helped somewhat by Fulham’s failure to press us on the ball; despite us being on the ball significantly more than our visitors we made 65 pressing contacts* compared to Fulham’s 56. Pienaar’s display was extremely fluid. From the first whistle he was buzzing around making things happen and won an early foul from a trademark run inside. 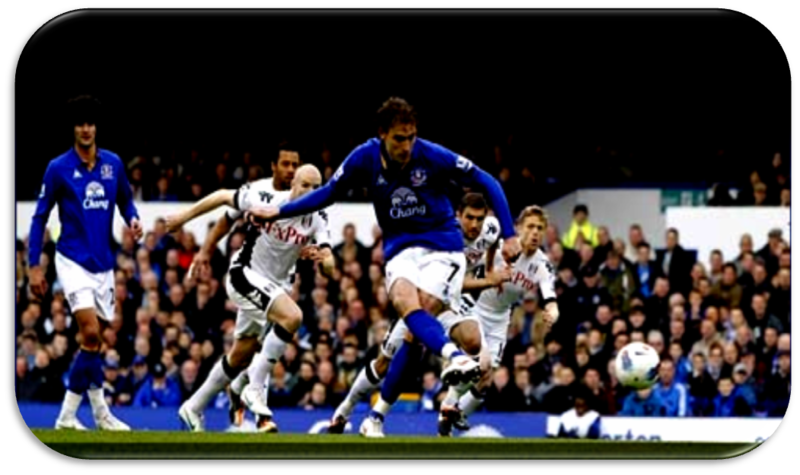 Jelavic’s resulting free kick was handled by Pogrebnyak and the Croatian coolly slotted home from his spot kick. The second came from a Pienaar corner which Fellaini headed home after Chucklebrother style defending from former toffee Senderos (marking) and Duff (air kick on line). 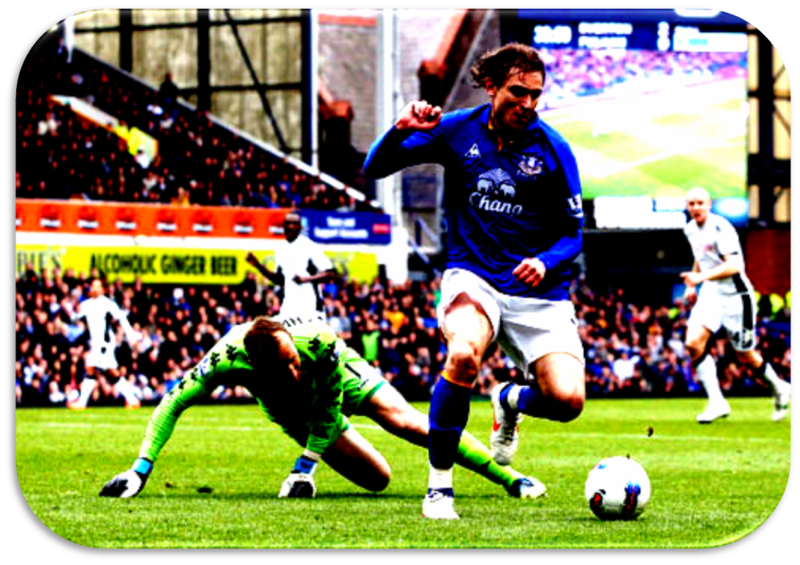 When Fulham failed to track Pienaar’s run from his own half the mercurial playmaker’s resulting through ball was dispatched by the ruthless Jelavic to make it 3-0 as the Blues threatened to run riot. Fulham are the lowest scorers on their travels in the top flight and thus the game was as good as over as a contest by half time. The influence Pienaar has made since arriving is hard to emphasise through stats alone but here are a few of the key ones; he averages the most key passes per game (2.5) in our squad, the most dribbles per game (1.1) and is our most fouled player (2.8 per game). He also has 7 direct assists with 2 other fouls on the pint sized schemer having led to goals. He also has 3 goals to his credit. To put that into perspective, Man City’s David Silva has the most assists in the top flight (13) which has taken 2636 minutes to accumulate which is 1 every 202 minutes. Pienaar has played just 879 minutes and has claimed 7 – thats 1 every 125 minutes – making him almost twice as prolific as Silva. Fulham didn’t threaten much at all in what was a fairly insipid display by our visitors. The Cottagers were reliant on playing out from the back with Hughes to Diarra to Demeble the pre rehearsed move. Rumoured L4 transfer target Clint Dempsey was looking less of a threat and more easily marked centrally than he is making ghosting runs off the flank. Whilst the American is very much a player in form he is 30 next year and with the age of our squad already imbalanced I’m unsure the American would significantly improve the options we have available given the budget we have. 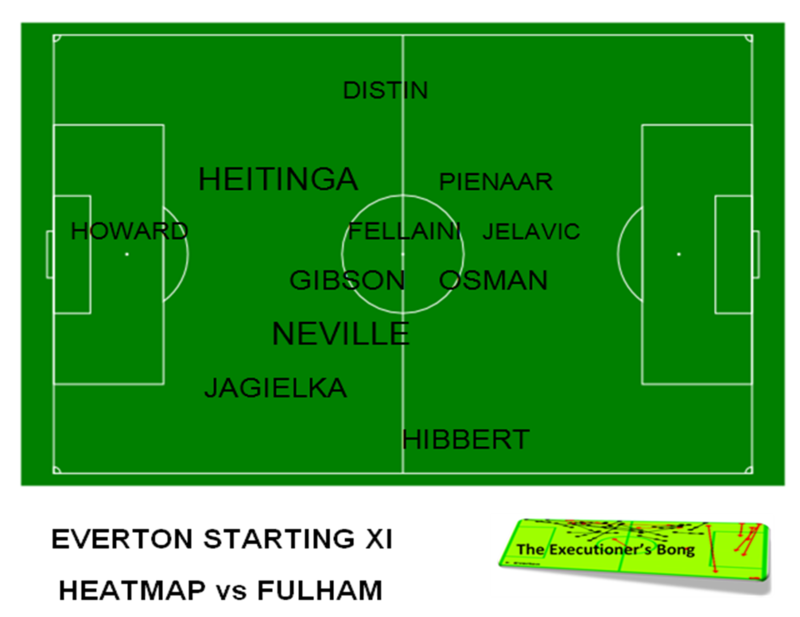 As mentioned in the preview, Fulham play very narrow and attack centrally more than any side in the top flight. Frei and Duff both played on the flank of their unfavourable foot – an inverted winger if you like – but failed to really penetrate us at any stage of the game. When in the defensive phase our wide players tucked in and overcrowded the centre of the field making it tricky for Fulham to play through us. The visitor’s woes were compounded in the second period when they again failed to track a midfield run with Pienaar able to pick up his third assist after a nice one two with Cahill resulted in the Aussie volleying home after a delicate scoop from the South African craftsman. This was as routine a game as you will ever get in the top flight. Granted, Fulham were slack especially in the first half but our passing and pressure off the ball early on were superb. The second half was something of a stroll but was productive in being able to give Barkley a stint in the midfield-attack pivot role – a position he could find himself deployed into with more regularity next season. The win keeps our great form ticking along nicely and we now take on Stoke midweek, a team we have scored just 1 goal against in our last 4 meetings. With the creation of Pienaar and the ruthless finishing of Jelavic however its hard to not see us opening them up at least once.